Sunlight Ambulette Services is a non-emergency medical transportation (Ambulette) provider. Our focus is simple- to deliver the highest level of customer satisfaction while focusing on patient care and safety. We specialize in quality door-to-door wheelchair and ambulatory transportation for the elderly, disabled, and people with limited mobility. Privately owned, Sunlight Ambulette Services began servicing New York City’s Ambulette needs in 2002. Our experience has translated into many of the practices Sunlight Ambulette Services adheres to on a daily basis. Each Ambulette is custom built to meet the American Disabilities Act (ADA) requirements. Our fleet is inspected by the Department of Motor Vehicle, New York State – Passenger and Freight Safety Division every 6 months and goes through a rigorous preventative maintenance program all year around by a local mechanic who specializes in fleet repairs. 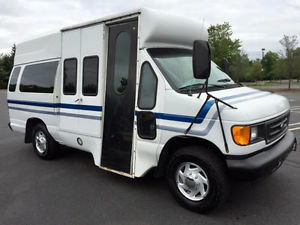 The vans are all equipped with hydraulic lifts, fully heated and air conditioned, cleaned daily, and have the newest technology in tie down fasteners for the utmost safety and convenience for our passengers. Before we even train our drivers, there is a long and thorough process we follow to determine if potential candidates are compatible to work for Sunlight Ambulette Services. First, our candidates are interviewed by management to determine if they would be a good fit at our company. Then, if impressive during the interview, we will immediately bring up their driving record from the DMV website to check for any driving infractions. The candidates are then sent to a local doctor for a full physical examination to determine if they are fit enough to handle the daily rigors of the job. While at the doctor, they are then drug screened. If the physical examination is passed and the drug screen comes back negative for all substances, the candidate is invited to start the training process. The candidate is then trained by a senior staff member before they are allowed to operate a vehicle on their own. Not only are the candidates trained in all the necessary safety techniques we endure each day, but to compassionately understand the difficulties that arise for persons that use our service. Our drivers are trained to be thoughtful and show empathy toward each person they come in contact with. Once the candidate passes these steps, they are put on a 90 day no fault probationary period. This complete hiring process ensures that Sunlight Ambulette Services is putting the right people in the driver’s seat that handle our most delicate possessions for our customers. Sunlight Ambulette Services is New York State licensed and approved. We are fully insured and meet or exceed all state and county insurance requirements.